Few books published in English in Iran under Shah Mohammed Reza Pahlavi offer a wider window on epochal events of the period than this tome by Zaven N. Davidian, writes SAJID RIZVI. 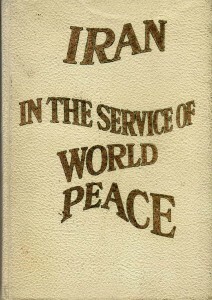 Published in 1971 under the aegis of the University of Isfahan Department of International Relations, Iran in the service of world peace was among a handful of titles rushed out in English that marked what became a highly controversial 2500th anniversary of the Shah’s celebration of the ‘Iranian Empire’ in Persepolis. The Persepolis celebration was a politically charged cultural event, a potent political statement by the Shah’s administration packaged in seductive artistic terms, a lavish extravaganza in which the West heartily took part. The western press panned it or praised it, depending upon personal or institutional allegiances of those writing the words. Davidian was Director, International Relations, University of Isfahan, and no matter what one may think of that heady period of Iranian history, his work is a detailed academic offering, suffused with optimism about Iran, about the Shah and about the country, an upbeat outlook that was genuinely shared by millions of Iranians and by Iran’s partners at the time, mostly notably the United States.